Put Turkey on you mountain biking radar screen! I can only comment on the possibilities of mountain biking in Turkey, which are indeed very great. I would have liked to offer you some true single-track and double-track routes with specifics, but I am not able. I went out exploring during 7 days and I often had to use paved roads and even highways to patch together my travels. In any case, I noticed some excellent potential and hope that this offers others a head start to establishing true mountain biking routes in Turkey. The areas I explored are not far from Istanbul. On my first 5-day outing, I crossed the Mamara sea by ferry to Yalova. My objective was Bursa by double-track and single track if possible. I had a Turkish road atlas that seemed to have much detail, but as concerns the smaller roads I found many errors in classification of the route type and I even found that some of the routes that did not exist (at least the locals had no knowledge of certain marked routes). The atlas is called (Turkiye Karayollari Harita Kitabi), but I cannot highly recommend it. From Yalova, I went West towards Kadikoy (~8km) then south to Kurtkoy (~7km). It was on this route that I first discovered the humor of the Turkish road engineers. Whereas in the US no paved road is allowed to have more than a 9% grade (I believe), I found that the Turkish norms are something like >12% grade. This may not be entirely accurate, but suffice it to say that the roads are frickiní steep! At Kurtkoy, I got my first taste of some nice double-track. With some serious interrogations of the local population, I was able to locate a double-track route that took me (East) up and over a nice pass then down to Cengiler (~15km). Unfortunately, Cengiler is on the main highway to Bursa. And after being discouraged by not locating the two ëtracksí that were marked on my map (one of these was to take me all the way south to Gemlik) I decided to follow, instead, the highway to Gemlik. Just after Gemlic (~2km) there is a turn-off that heads west towards the coast of the Mamara Sea (direction of Mudanya). I took this paved road to the village of KursunluÖall the while munching on fresh figs that grow on the edges of the olive groves. South from Kursunlu there is a road that goes to Gundogdu and then on to Yunuseli (just outside of Bursa). This was a fantastic climb. The town of Gundigdu sits right at the crest of a nice mountain range that separates the Mamara from Bursa. Here I was able to confirm that the humor of the Turkish road engineers was no fluke! The climb was ëchallengingí to say the least. The downhill was quite nice as well. I hit 65 kmph on my mountain bike with full back rack. In Bursa, one can try to climb to Mount Uludag. This is a steady 30km climb from Bursa to the ski area and then a 30km downhill. It is a gravel/paved road. Beautiful scenery and steady climbing all the way upÖbut the free-roaming dogs are a real and continual menace. I had to give one a mouthful of my shoe, so he would not take a mouthful of my leg. After these days of riding, I then took some back roads to Bandirma via Mustafa Kemal Pasa. The first day I camped just outside Mustafa Kemal Pasa. The second day, in trying to stay on the back roads as much as possible, I ended up turning what was supposed to be a four-hour day into a 12-hour day! The climbing on the back roads from Karecabey to Bandirma (via Golechick, Sahmelek and EmrÈ) are quite challenging. You are either climbing or speeding downhill. This area merits some more exploration, but it warrants a good dose of energy and backpack full of food and water. From Bandirama I took the ferry back to Istanbul. 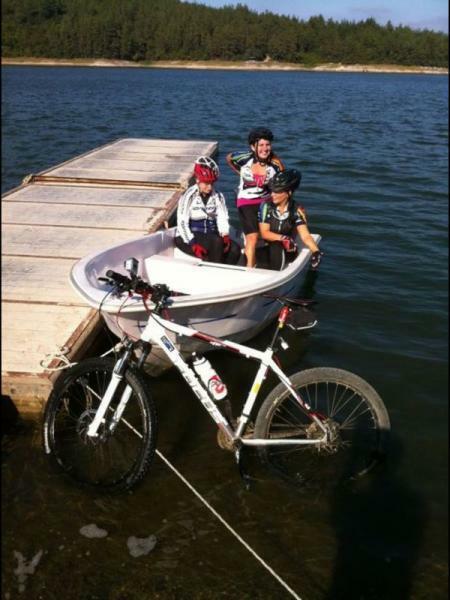 The ferries are a great way to travel and they easily make accommodations for your bike. There is a small fee to bring your bike. My second outing was near Sile on the coast of the Black sea, but only a 1 hr drive from Istanbul. Sile is a fishing town with well known tourism potential. The area just South of Sile, near Daralik and Teke, are full of narrow double tracks that crisscross the country side. If I were with someone, I would have done much more exploring on these double tracks, but they were completely unmarked on my map, steep and dangerous in places. One only needs a riding buddy and a compass to have a great time in this area. In conclusion, I think Turkey really needs to be on the map for mountain biking. Istanbul is an excellent city to visit for its music, nightlife and progressive young crowd. I can imagine Turkey hosting some serious MB competitions in the future. Oh, by the way, I found a very friendly bike shop that deals in Trek cycles. Look for the Trek sign on Gilipdede Cadessi Street just below the Galataturm Tower in the Taksim area. I donít know your opinion of Trek, but amidst the plethora of hack shops selling chinese-made, reverse-engineered full suspension mountain bikes this place looks like heaven. The owner cited me a statistic that indicates that serious mountain biking is growing in Turkey. In 2003 they sold 600 Trek bikes and in 2004 they sold 1000 trek bikes. Review: There are more difficult areas in Ä°stanbul. Turkey Trails MTB Trail 5.00 out of 5 based on 1 ratings. 1 user reviews.